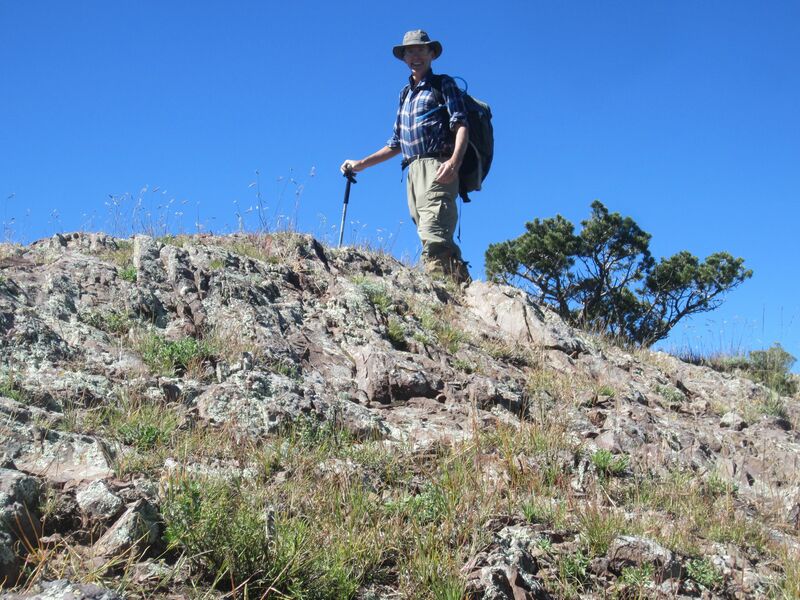 Argentina Peak is a small bump on the crest of the Sierra Blanca Range (a.k.a. the White Mountains). This is an easy hike up and onto the ridge line. There are views west to White Sands National Monument in the Tularosa Basin, south along the crest to Lookout Peak and north to Nogal Mountain. 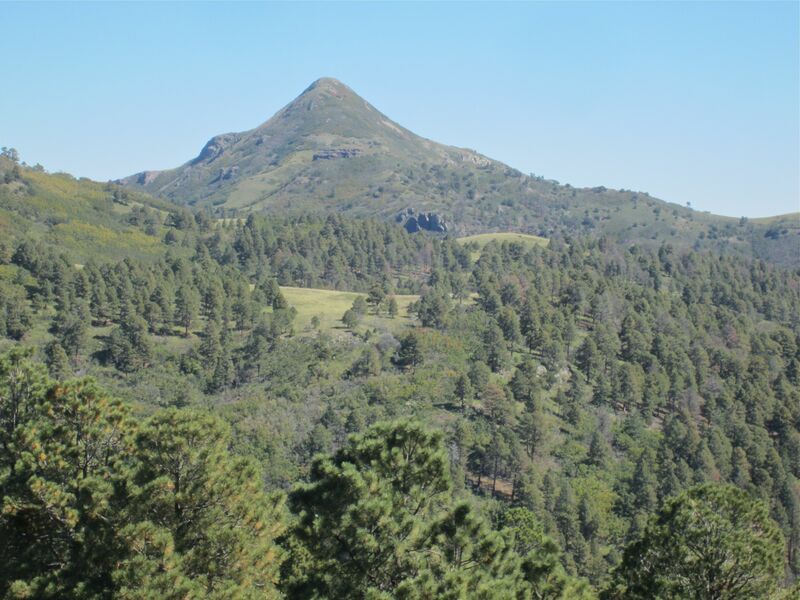 This is an ideal trail for introducing a newcomer to the wonders of New Mexico’s high country. From Lohmann Ave in Las Cruces, go north onto I-25. After 2.5 miles take the exit for US 70 East. After 61.7 miles, immediately after the third stop light light in Alamogordo, go right onto the ramp for the Charlie Lee Memorial Relief Route. After 0.3 miles, at the end of the ramp, go left onto the Charlie Lee Memorial Relief Route. After 42.0 miles, at a stoplight, go left onto NM-48. After 1.3 miles, go left onto Forest Service Road 107. (There are signs on NM-37 for Bonito Lake). After 8.3 miles on FR-107 the road ends with a short loop. Park by the sign for Big Bonito Creek Trail 36, at the end of the loop. FR-107 is heavily potholed in both its paved and gravel stretches – use caution. The terminal loop of FR-107 has a large area devoted to car camping. There are pit toilets and corrals for horses. Water is available from Big Bonito Creek, but should be treated before use. A few weeks ago the water was very high and carried a great deal of soot (presumably from the Little Bear fire of 2012). On this date, however, the streams were clear. You may not need to let the colloids settle before filtering. Sign marking the trailhead. Hiking past this sign will launch you on the clockwise direction. This is a loop hike and will be described in the counter-clockwise direction. Either direction should work fine. If it has been wet and crossings of Big Bonito Creek threaten to leave you with wet feet, then going counter-clockwise may be advisable (your feet should remain dry for all but the last 2 miles of the hike). In this direction the descent from Argentina Peak provides you with views of Lookout Peak and White Horse Hill. On the other hand, the descent from Argentina Peak in the clockwise direction gives you memorable views of the crest north to Nogal Peak. Subalpine terrain – meadows appear as the trees become more widely spaced. From the trailhead find a boot beaten path that ascends the Argentina Canyon bank immediately above your parked vehicle. In about 100 feet, come to the intersection with Argentina Canyon Trail No. 39 (signed). That steep bank is about the most difficult part of this hike. From this junction the trail ascends gently towards the crest in a forest of Douglas Fir and Ponderosa. Reports indicate that the canyon bed usually has water, although at times during the recent drought that water was hard to find. Currently the creek flows merrily, still influenced by a good monsoon and the remnants of hurricane Odile. In 1.7 miles come to an intersection with the Cut-Across Trail No. 38 (coming in from your left). The Cross-Across Trail would bring you to Little Bonito Creek, cutting off the portion of the route that lies on the crest. Taking the Cut-Across substantially reduces the length of your hike. That could be a good option if someone in your group is flagging and you don’t want to simply return the way you came. For most hikers the the promise of montane grasslands will retain its allure, so go straight ahead on Trail 39. 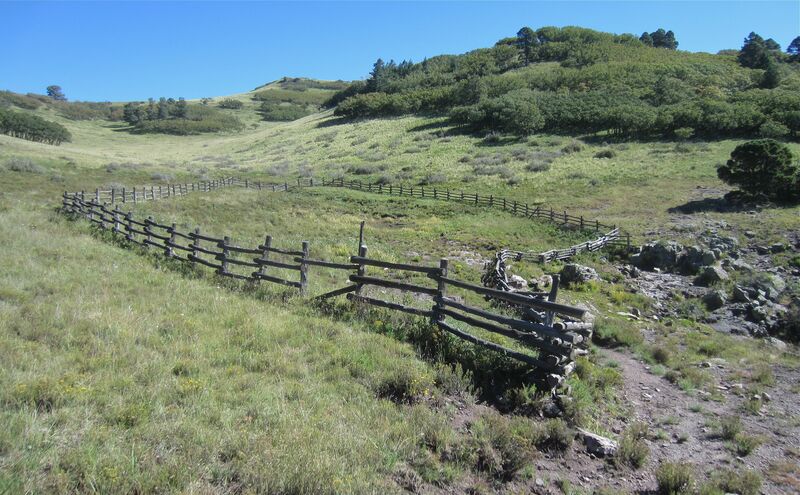 Split rail fencing off the Argentina Canyon seep. Argentina Canyon is to the left. At 2.4 miles from the trailhead come to the headwaters of Argentina Canyon. A split rail fence curtains off a large grassy area, and at the lowest point on the fence line there is a cemented stone wall forming a horse trough. On this date the trough was brimming full of water. (It can be dry). It turns out that the fence is not a corral for keeping trail horses penned near the crest. In fact, it has no gate at all. The fence is intended to keep elk, deer, horses, hikers and hunters from pulverizing (and otherwise polluting) the seeps from which Argentina Spring flows. Traverse to the left to get around the fenced area and rise to the intersection with the Crest Trail, #25. Note of caution – there are coils of old barbed wire fencing hidden in the grasses. View from Argentina Peak summit south to Spring Point (flat topped, center), White Horse Hill (grassy knoll) and Lookout Peak (forested, on left). 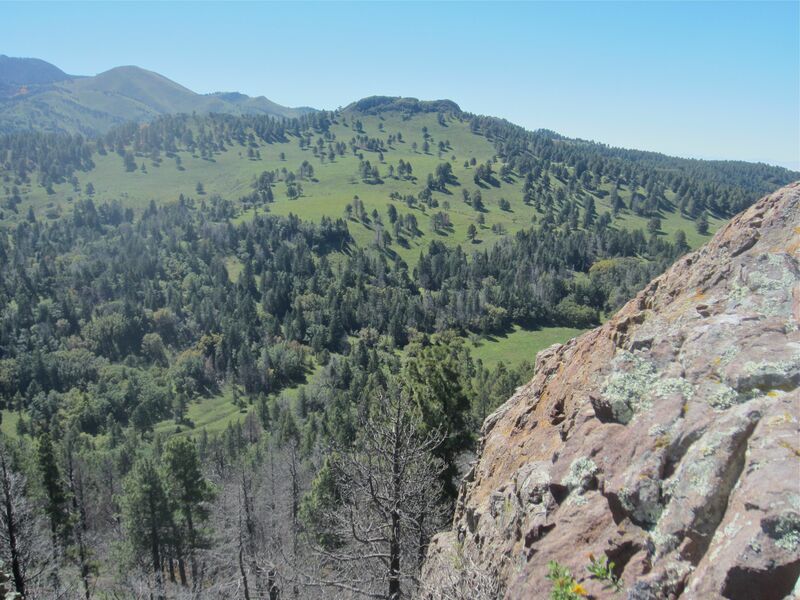 Take a moment to enjoy the view of the Tularosa Basin as you reach the crest then go south (left) on the Crest Trail No. 25. Take, too, a deep breath as you enjoy the benefits of working out at 9000 feet. Ascend gently sloping grasslands to pull away from the saddle above Argentina Canyon. Your destination is Argentina Peak, but this peak is one of a series of small rock outcroppings that populate the crest. To get there you must go a short distance off-trail. Watch for a spot on the Crest Trail where it approaches a little rise of about 20 feet. The trail dodges this bump by dropping off the crest to the east (to the left). Go off trail and ascend the rise. At the top, looking south, you will see another small rise and you will ascend to it. After three or four such rises you will come to one that has a 20 to 30 foot cliff on its south side. That bump, at 3.1 miles from the trailhead, is the summit of Argentina Peak. View of Nogal Peak from the crest. There are several points along the crest where you get wonderful views north to Nogal Peak. Off to the the west is the Tularosa Basin, home to the White Sands National Monument. The western horizon is dominated by the San Andreas Range. To the northwest lie the Magdelana Mountains and I believe you can see the Ladron Range to the north of the Maggies. To the east the convoluted terrain of the Sierra Blanca range arrests the eye. A great deal of this terrain is scarred by the after-effects of the Little Bear fire of 2012. 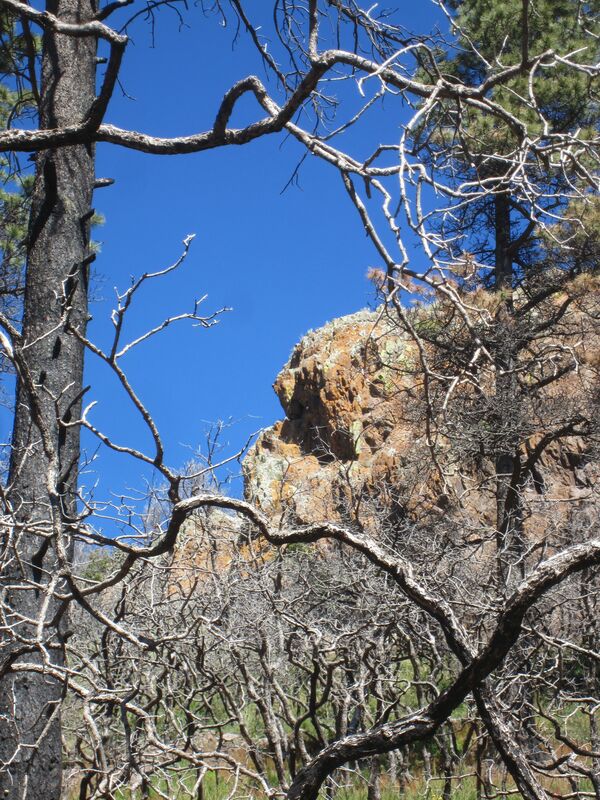 To return to the trail, descend from Argentina Peak to the east (away from the Tularosa Basin). There is a patch of oaks to work through or around. After a descent of less than 100 feet you will arrive in a piney meadow on the top of a flat, east-trending rib. Currently the Crest Trail is a prominent tough in the low-point of this meadow with an almost road-like appearance. Turn right (south) and continue on Trail 25 as it wraps around to the south side of Argentina Peak, directly below the cliffs. From there the trail drops fairly steeply to the saddle between Argentina Peak and Spring Point. 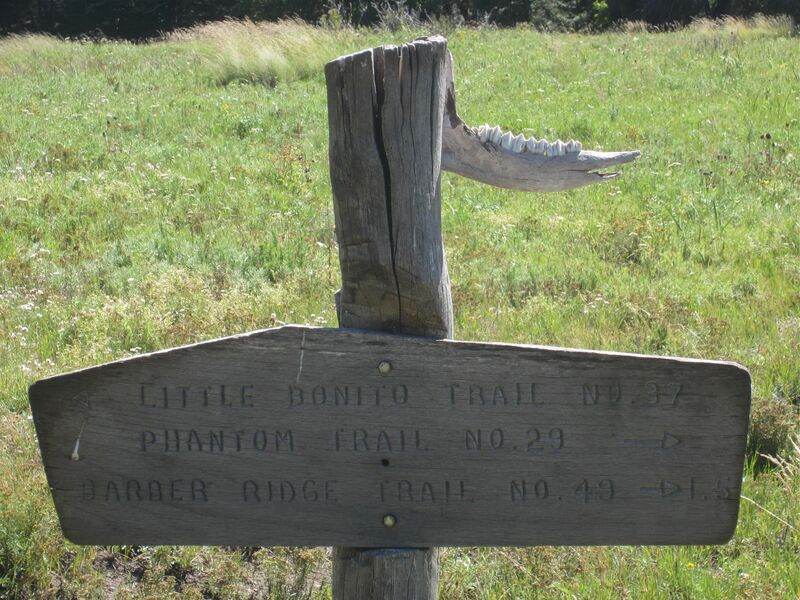 At 3.7 miles from the trailhead the Crest Trail arrives at a complex junction with the Little Bonito Trail (your destination) and two trails descending towards the west – the Phantom Trail and the Barbar Ridge Trail. Unless you are tremendously ambitious you probably don’t want to descend to the west! 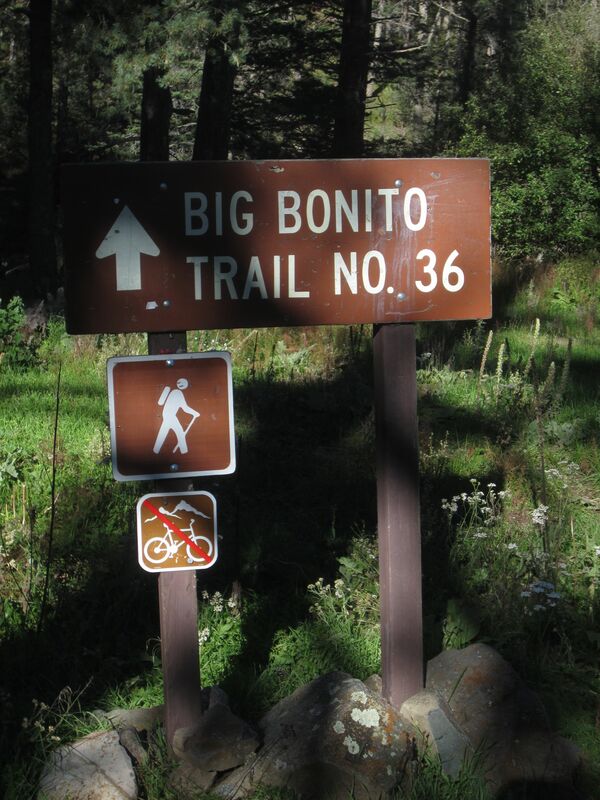 Take the Little Bonito Trail No 37 to head east back to the trailhead. Like Argentina Canyon, the drop down Little Bonito Creek is quite mellow. The creek is, as of this writing, flowing from the top. It makes for a musical accompaniment as you descend away from the grassland and back into the pine forest. There is more evidence of the Little Bear fire, but nothing like the desolation seen further to the south and east. 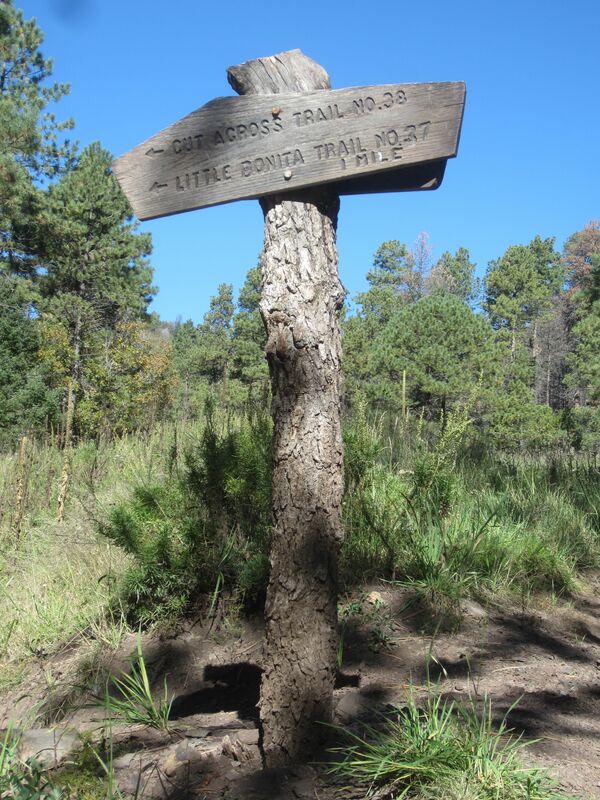 At 4.0 miles from the trailhead you will encounter another signed junction with the Cut-Across Trail. Continue to descend on the Little Bonito Creek Trail and at 5.2 miles there is a confluence between the Little Bonito Creek and the Big Bonito Creek. Shortly after, there begins a series of eight stream crossings. Two weeks prior, each of these crossings would have meant drenched boots. On this date it was possible to rock-hop across with dry feet. 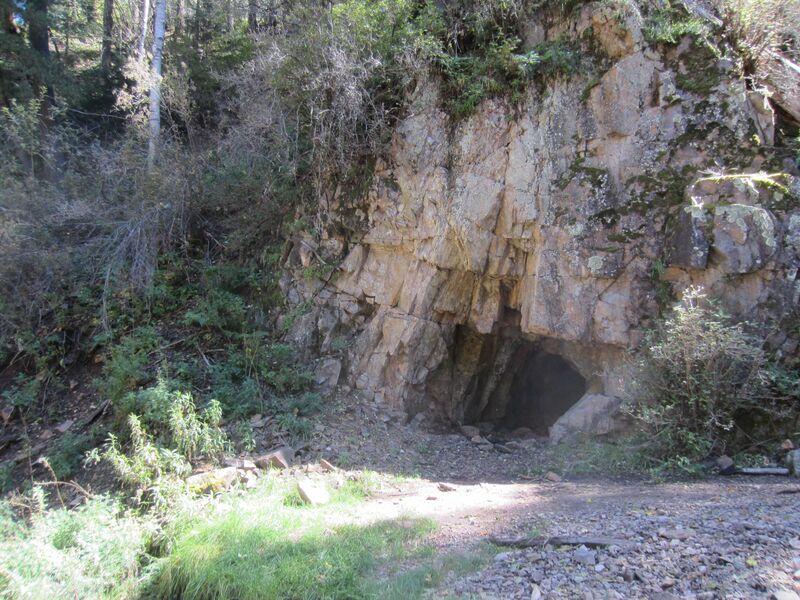 At 6.2 miles find the last of the stream crossings and an old mine shaft dug into the hard rock making up a canyon wall. Alas! it is only 0.3 more miles and you will be back at the trailhead. ♦Take friends. This is one of the most hospitable places I’ve seen in southern New Mexico. If you are at all worried about off-trail navigating to get to Argentine Peak then feel free to skip it. The views from the Crest Trail are fine. ♦Both Argentina Canyon and Little Bonito Creek are often dry in the upper reaches. Bring water. In the autumn just two liters of water should be plenty. 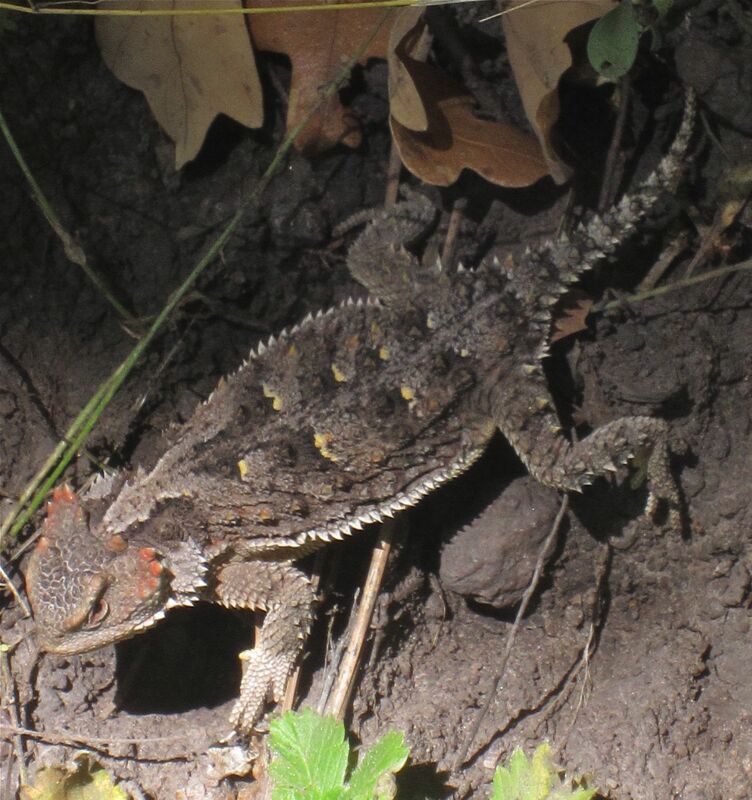 Horned toad competing for trail space on the Little Bonito Creek Trail. 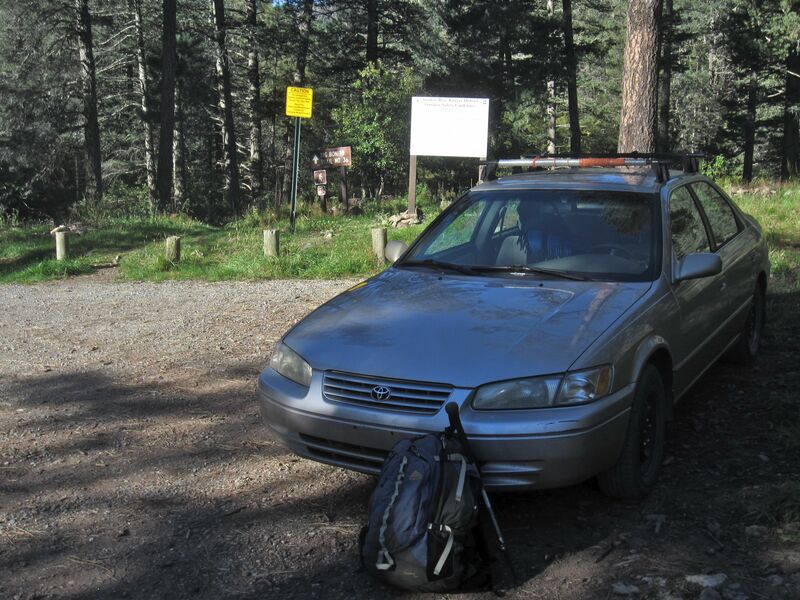 ♦I believe hunting season is on (two weeks ago there were bow hunters at the trailhead). Perhaps as a consequence, I didn’t see any deer or elk while hiking nor did I hear any elk bugling. (In contrast, there was a herd of deer grazing on the northern outskirts of Ruidoso – be careful on the drive in)! ♦The number of bugs and reptiles has diminished in the last few weeks and even though the grasses were vividly green they were running to seed. It looks like nature is preparing for winter. ♦ Argentina Peak is just a bump on the Sierra Blanca Range crest, you won’t find too many sites devoted specifically to this destination. If you’re searching then “argentina canyon” works better as a keyword. That will give you many hits to destinations in this area of the crest. ♦ Johnny Hughes at Ruidoso.Net has a detailed description of this loop (he follows the loop clockwise). It is interesting to learn that Little Bonito Creek in most years has water in its lower reaches. 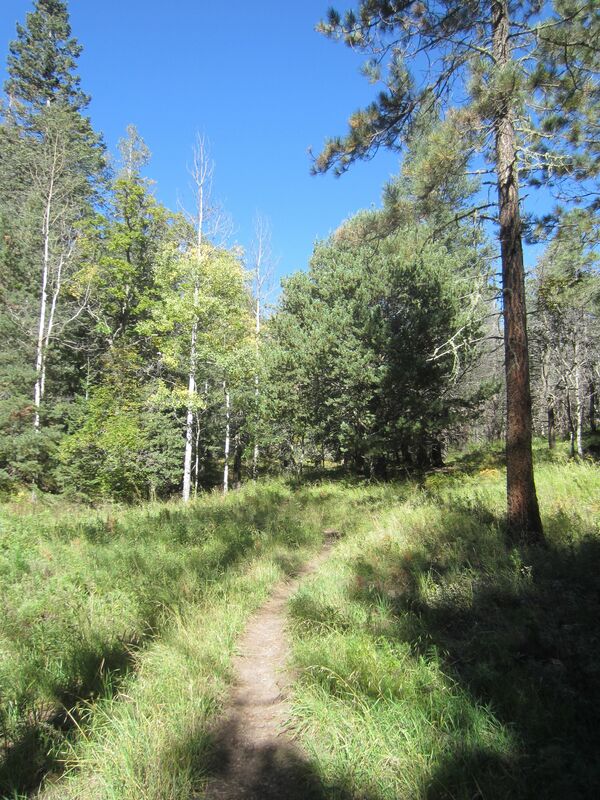 ♦ The Forest Service has an odd, but eventually useful, map of the trails in the area. It shows the trails and provides each trail with a trail number. Nearby roads and the outline of the national forest are also shown. Trailheads are named. However, the map is shorn of virtually every other piece of information that might help you to pick a trail. No mountain is named, no canyon is identified, no stream is labeled. There are no contour lines. Other than trail number, each trail remains an anonymous black line against a uniform gray background. I can only recommend that you use the information on this site to get up onto the White Mountains and become familiar with the terrain. After a couple trips, the forest service map becomes a useful inventory to the trails that you’ve been missing!